St. Paddy's Day is always fun. I love the prep time for the theme. Green beer (though I don't drink), cornbeef, cabbage soup, and pretty much any delicacies that look great with green food coloring are on the menu. Of course, sweets and treats are all around. For cupcakes, smittenkitchen.com has a fantastic recipe for car bomb cupcakes. These pictures are from last year. More of the same will be made this year. 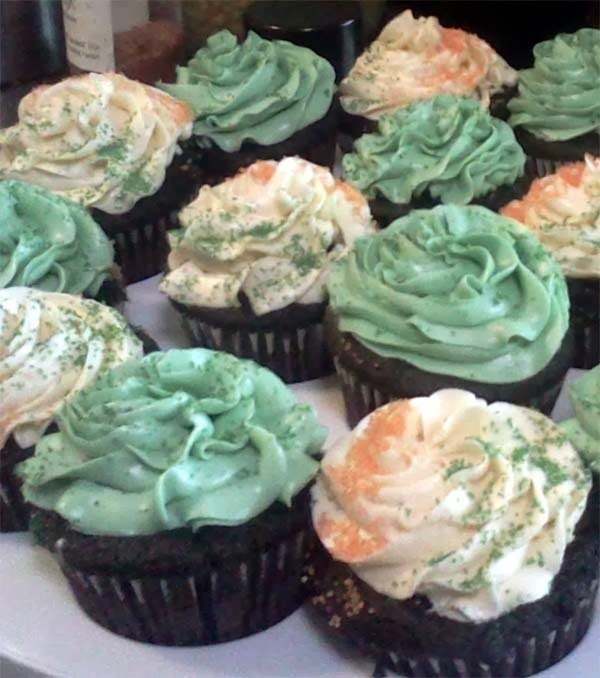 Note: Swiss Buttercream with food coloring was used for frosting instead of the Baileys mix in the cupcake recipe. Make the cupcakes: Preheat oven to 350°F. Line 24 cupcake cups with liners. Bring 1 cup stout and 1 cup butter to simmer in heavy large saucepan over medium heat. Add cocoa powder and whisk until mixture is smooth. Cool slightly. Whisk flour, sugar, baking soda, and 3/4 teaspoon salt in large bowl to blend. Using electric mixer, beat eggs and sour cream in another large bowl to blend. Add stout-chocolate mixture to egg mixture and beat just to combine. Add flour mixture and beat briefly on slow speed. Using rubber spatula, fold batter until completely combined. Divide batter among cupcake liners, filling them 2/3 to 3/4 of the way. Bake cake until tester inserted into center comes out clean, rotating them once front to back if your oven bakes unevenly, about 17 minutes. Cool cupcakes on a rack completely. Make the filling: Chop the chocolate and transfer it to a heatproof bowl. Heat the cream until simmering and pour it over the chocolate. Let it sit for one minute and then stir until smooth. (If this has not sufficiently melted the chocolate, you can return it to a double-boiler to gently melt what remains. 20 seconds in the microwave, watching carefully, will also work.) Add the butter and whiskey (if you’re using it) and stir until combined. Fill the cupcakes: Let the ganache cool until thick but still soft enough to be piped (the fridge will speed this along but you must stir it every 10 minutes). Meanwhile, using your 1-inch round cookie cutter or an apple corer, cut the centers out of the cooled cupcakes. You want to go most of the way down the cupcake but not cut through the bottom — aim for 2/3 of the way. A slim spoon or grapefruit knife will help you get the center out. Those are your “tasters”. Put the ganache into a piping bag with a wide tip and fill the holes in each cupcake to the top. Whisk egg whites and sugar together in a big metal bowl over a pot of simmering water. Whisk occasionally until you can’t feel the sugar granules when you rub the mixture between your fingers. Finally, add the butter a stick at a time and whip, whip, whip. Don't forget to add green food coloring to stay with the theme. Spread on top of the cupcakes or use a piping tube and decorate. Sprinkle edible glitters for added decor. 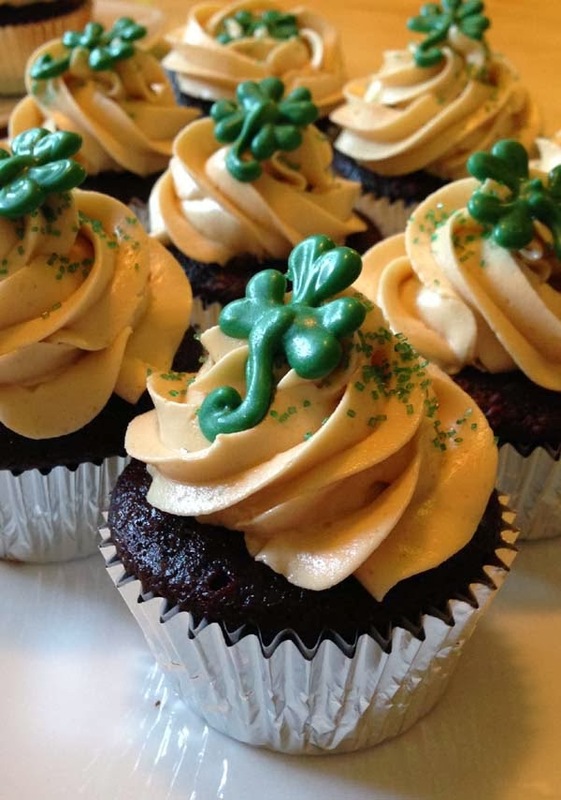 There are many ways to decorate cupcakes for St. Patrick's Day. 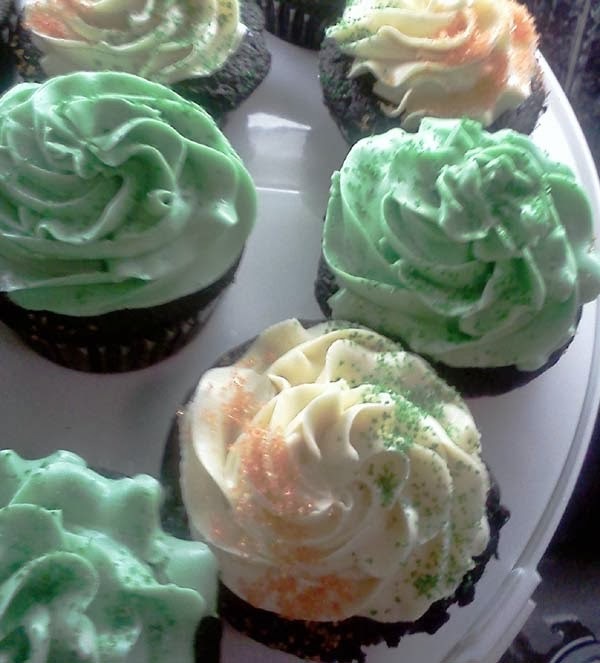 Here are some cupcakes made by someone else where the butter cream was made with browned butter and an edible shamrock charm. See here on how to brown the butter.